Bridgetown (Barbados), May 2 (IANS) England captain Alastair Cook stroked his first Test hundred in two years at the historic Kensington Oval but a brace of wickets from seamers Jason Holder and Shannon Gabriel gave the West Indies the edge on the opening day of the third Test here. Opting to bat, the visitors finished Friday at 240/7 with Cook carving out 105, his 26th century, before falling on the last ball of the day, reports CMC. Left-hander Moeen Ali chipped in with 58 while in-form Joe Root hit 33 and Ben Stokes, 22, but England were not allowed to build partnerships as West Indies struck at critical intervals to limit their progress. Holder, who grabbed both his wickets before lunch, finished with 2/34 while Gabriel was again impressive with 2/36. With his batsmen getting starts but failing to convert, it was left to Cook to hold the innings together in a knock spanning 266 deliveries, including 12 fours. He was forced to spearhead several recovery efforts. When England slumped to 38/3, he put on 53 with Root and then added a further 98 for the fifth wicket with Moeen when England slipped to 91/4. 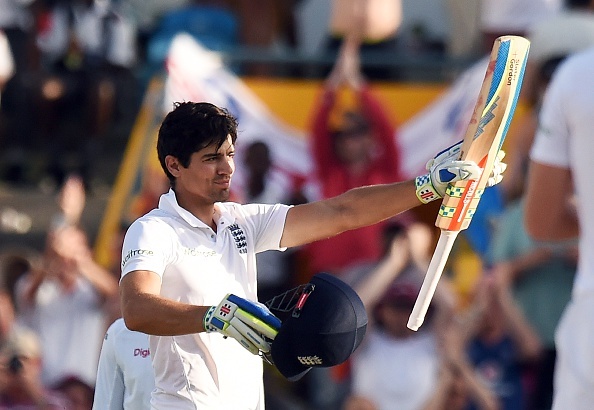 In the final session, Cook put on 44 with Stokes for the sixth wicket. Before a crowd of nearly 12,000, West Indies started brightly when Gabriel knocked over the out-of-sorts Jonathan Trott without scoring in the day's second over. For Trott, it was the third time in the series he had fallen without scoring and his fourth single digit score in five outings. England then crawled to 22/1 as Cook and fellow left-hander Gary Ballance repaired the innings, but Holder struck twice in quick succession, to put West Indies in control. Ballance had made 18 and added 38 with Cook when Holder breached his defence to pluck out his middle stump. Holder accounted for the dangerous Ian Bell without scoring, moving to his left to claim a two-handed return catch after the right-hander drove airily. Cook and Root saw England safely to lunch at 71/3 and the right-handed Root moved nicely along afterward. However, Root then perished at Veerasammy Permaul's hands, edging a catch to wicketkeeper Denesh Ramdin. The session nonetheless belonged to England as Cook and Moeen denied the Windies any further success with the best partnership of the innings. Moeen played freely and was unbeaten on 37 at tea with Cook on 60 and raised his half-century after the resumption. Both looked well set for big scores when without warning, Moeen was run out attempting a sharp single. Stokes hung around and hit three fours and was building another partnership with Cook, before falling with the new ball. Cook, meanwhile, remained steadfast, to move into the 90s before clipping the same bowler to the mid-wicket boundary four overs later, to reach triple figures. There was disappointment for the England skipper, however, as he fell in the day's final over from Marlon Samuels, under-edging a cut for Ramdin to take a smart catch.